Kobe gifted Paul George with a pair of his sneakers. 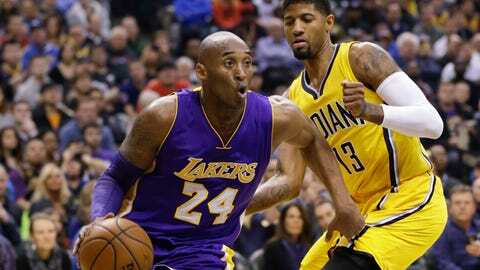 Like many of today’s younger NBA stars, Paul George remembers idolizing Kobe Bryant. He lived not far from Los Angeles in Palmdale, and grew up watching Bryant play in the prime of his career. After scoring a game-high 21 points to lead his Pacers to victory over the Lakers in what was the final time he’ll face Bryant on the court in a game that counts, George received a gift from his childhood hero that he’ll undoubtedly cherish forever. That’s the All-Star colorway of the Kobe 11 Elite, which is set to release on Feb. 11.